Recollecting the day they completed their studies is enough for many graduates to either break out in a sweat or to lift a glass to toast the achievement. As years go by discussion often centres on the date and year of graduation and, who, among their peers, has become famous or infamous. Unfortunately, this discussion leads to confusion as some do not understand that the official date of their degree is the date of conferral not the date of completion of studies. For those who finished at the end of the year, the date of completion is in December of the year of conclusion of studies with the conferral normally following in the ensuing year at an Autumn Ceremony in March or April. As a consequence some people inadvertently consider themselves to be graduates of the year they completed study, when strictly speaking it was the year the degree was conferred by Senate. For a variety of reasons these individuals may not have walked across the stage in Winthrop Hall to shake the hand of the Chancellor. Some who have not done so have returned years later to have their degrees conferred and some apply to have it done "in absentia". 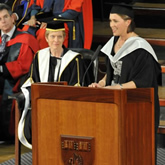 The University has statutes and policies governing the completion and conferral of awards within the context of maintaining the University's reputation as a University of the highest international standing. The purpose is to: ensure consistency in the standards applying to the awarding by the University of certificates for award courses; provide for the issuing of replacement certificates and true copies of award certificates; and provide for posthumous awards. All graduates of the University of Western Australia become Members of the Convocation of UWA Graduates upon admission to their degrees. What is Convocation? Membership of ConvocationContact the Office of ConvocationA Register of Graduates, containing the name and address of every person to whom a degree, diploma or certificate has been granted and particulars of each such degree, diploma or certificate, must be maintained by the Registrar. No person is considered to hold a degree, diploma or certificate of the University unless their name and the degree, diploma or certificate are recorded in the Register. The University’s online Award Verification Service provides a searchable database of most of the University’s graduates. The service displays all awards conferred from 1985 onwards and contains a majority of the University's earlier graduate records dating back to 1917. The University website also publishes further detailed information about graduation matters. If you wish to seek clarification around any aspect of your degree you can contact the Graduation Officer, Daniela Giovannetti, on (+61 8) 6488 2465 or email daniela.giovannetti@iwa.edu.au.